SolidWorks Enterprise PDM 2014 - a software solution for safe storage, management and access to project data, allowing you to create new products faster and with better quality . It is specially optimized for companies with geographically extensive network of offices, subcontractors and suppliers . DBMS is based on technology Microsoft SQL Server. Being fully integrated with Microsoft Windows Explorer, system SolidWorks Enterprise PDM 2014 can be implemented in the workplace in a very short time with minimum staff training. Parts Required effective product information delivered at the right time for the cost of production to meet the needs of your customers. SolidWorks Enterprise PDM allows members of your organization work effectively together , to more quickly to market quality products. Improving the product development process by providing direct access to the most current versions of all documents and data using the integrated interface with Windows Explorer. Effective data management enables engineers, manufacturing , and marketing service to avoid mistakes , such as working with faulty versions of documents or accidentally overwrite a version of the document. In addition , SolidWorks Enterprise PDM allows intelligent database, re- use , preserve and enhance . Using a powerful , yet easy to use tool , product designers can quickly find your documents and avoid unnecessary data . industries , including machinery, electronics and medicine. with other systems in the enterprise , such as MRP / ERP, using industry-standard XML and other features . allows integration of widely dispersed corporate divisions , departments, customers and suppliers. With automatic replication of data to the set of placements, users can reduce the critical time when downloading large assemblies. Streamline processes with workflow automation. Built-slotting in SolidWorks Enterprise PDM can help your organization to automate approval processes for documents and reduce the number of errors while improving efficiency . For example, many operations can be executed automatically at a standard release a new version of the product , such as automatic control , data entry stamp in the drawing , a neutral file format and issue various notices , such as projects management and sales . Dual electronic signature is supported by the certificate of FDA CFR Part 11 and other industry requirements . 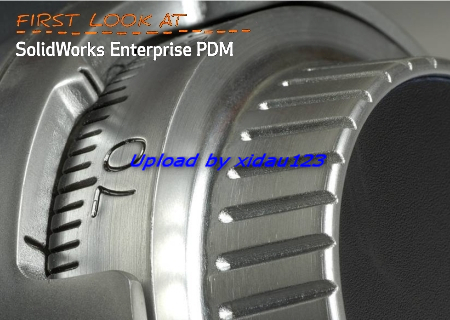 SolidWorks Enterprise PDM monitors and records every event, every movement of the instrument and each version. Instrument audit records - who did what and when, how and why each change was made , simplifies the preparation of reports to internal quality as a necessary requirement of the supervisory bodies and ISO auditors . Auditing activities more effectively and earlier can help to identify potential problems and continuously improve processes , increasing the ability to compete in your organization . Enterprise PDM can provide the right level of access to information for each member of your team, improving efficiency without compromising confidentiality or security. Dissemination of information about the product to customers and suppliers with SolidWorks Enterprise PDM shortens the product development process. for the client - configuration for SolidWorks 2014 .